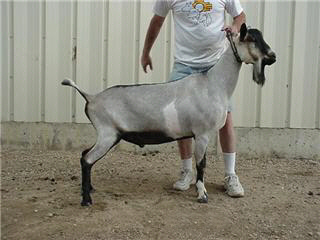 Git-R-Done (GRD) is the combination of milk, goatinality and style. 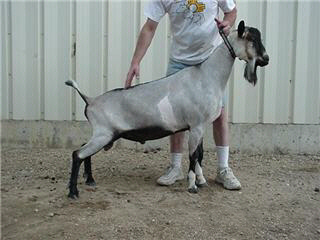 Five finished champions and five superior genetics’ in his pedigree. Spike’s daughters have proven to be very productive and have shown very well also. Spikes offspring have been at the top of the list for commercial dairies. This time, this one I was keeping. I had to keep something out of Spike because he was getting up there in years. Canada being one of my personal favorites, made it easy to pick GRD. These lines get better with age. At age two he has good size. He has a straight top line and great rear legs. He tracts straight and is wide between the hocks. His shoulders blend smooth into the withers. He has good strong pasterns. He has long open ribs and has a deep and angulated body. GRD gave me three bucks his first year. It looks like a few years before we can evaluate any daughters.